The one dish Mom made that was best in my books was her Southern Style Potato Salad. Well there was that and her Banana Pudding...oh! Well anyway you could just eat her potato salad for dinner and you would be fine. Nothing else was needed. It was that good. I watched her make this one day as she told me her recipe. After I making it a time or two at my house though I felt like something wasn't just right. Her potato salad had a little more flavor... a little more zing. One day I just happened to be over again while she was making potato salad for dinner. Out of the corner of my eye, I saw it. She added a little something. I said wait Mom what's that your adding? Oh just adding a little Pickle Juice she said. Didn't I tell you that? Well no Mom you didn't ...her secret was out. 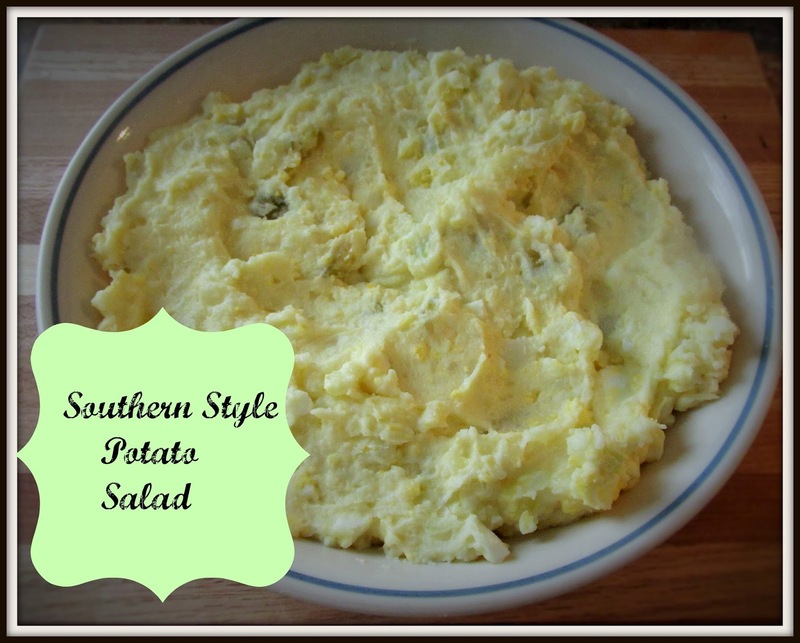 Have fun making this wonderful Southern Potato Salad for dinner, a picnic, or even increase the amount for a potluck. Peel and quarter the potatoes and put them in a pot of water to boil. Boil till done about 20 minutes. Mash the potatoes. Add the mashed hard boiled eggs, pickles, pickle juice, butter, onion, mayo and mustard. Stir until combined. You can serve this hot or cold.